The third shortlist for the 2013 Coffee Spot Awards is the “Best Neighbourhood Coffee Spot” Award. The Award is new for 2013 and celebrates those Coffee Spots which are firmly rooted in, and which serve, their local communities. Unsurprisingly, the shortlist contains some of my favourite Coffee Spots of 2013. This Award has quite a wide spread, with Coffee Spots from Boston, New York City, Montréal, Newcastle, Gateshead, Gatley (Manchester), London and just down the road from me in Godalming. Pushcart Coffee is pretty much my definition of a neighbourhood coffee shop, something the Americans seem to excel at. It’s a cosy little place, with community noticeboards and its own neighbourhood newsletter. 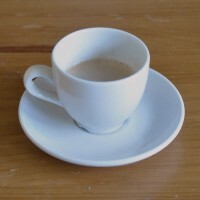 And excellent coffee! I only heard about True Grounds from a friend who used to work around the corner. It’s one of the best tips I’ve ever had. The highest praise I can give True Grounds is that I wish I lived or worked just around the corner too! I described Café Olimpico in Montréal as like your local, only serving old-fashioned Italian espresso instead of beer. Although this is Montréal, so everyone speaks French, in ever other aspect, including the coffee and cakes, this is as Italian as they come and a wonderful place. Café Olimpico is also in the running for the “Happiest Staff” Award. Café Mila is almost my neighbourhood café, just a short (hour and a half) walk down the river, or an eight minute train ride if I’m feeling lazy. It’s an absolutely lovely place and is featured in the Coffee Spot Calendar for 2014. Newcastle’s Settle Down Café has some pretty stiff competition in a city with four top-class Coffee Spots. However, the Settle Down can hold its head high with a strong community feel, some lovely staff, great coffee and excellent cakes. 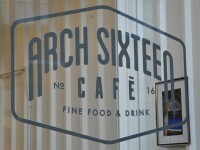 Just across the High Level Bridge from Newcastle, Arch Sixteen is flying the flag for Gateshead, with some excellent coffee in lovely, friendly surroundings. With film nights, open mic sessions and other innovations, Arch Sixteen is a real neighbourhood café. So much more than a Coffee Spot, Maida Vale’s Dry Goods Store in London is a wonderful place. It’s a throw-back to simpler times where you buy just want you and are encouraged by owner Yasmeen to recycle your packaging. Oh, and she sells and serves damn fine coffee too. And the winner is Café Mila!